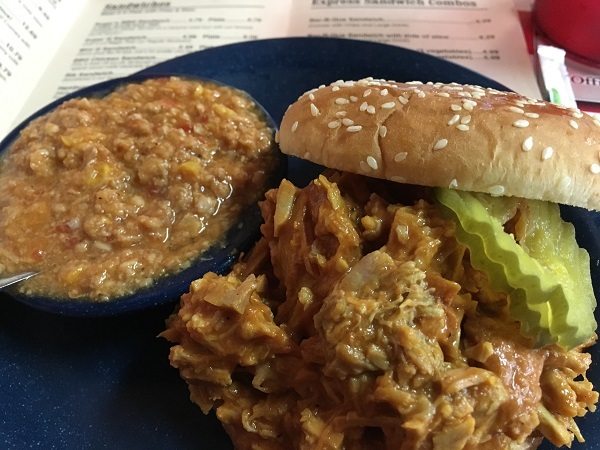 Roger’s Bar-B-Que, LaGrange GA – Marie, Let's Eat! Eagle-eyed readers might have spotted that, while we’ve always championed Georgia barbecue, we certainly have spotlighted a little more of it than usual this year. Between March and May, we made four day trips to sample as many new-to-us places as we realistically could before moving away. I’ve always been hopeful of finding something new and amazing, and I’ve always been hopeful that other bloggers and hobbyists will both follow up on some of these places, and discover more. So, as May ended, the four of us piled into the car for one last barbecue road trip around middle Georgia before we moved. This one would visit three in our state and two in Alabama. Unfortunately, we learned that one barbecue place in Phenix City, Corner Que, had closed last year, and one in Auburn, Price’s, would be shutting down soon, so the two Alabama stops that we made just “replaced” one each in those towns, which is a shame. For the first stop on the trip, we visited a place with a very long history. 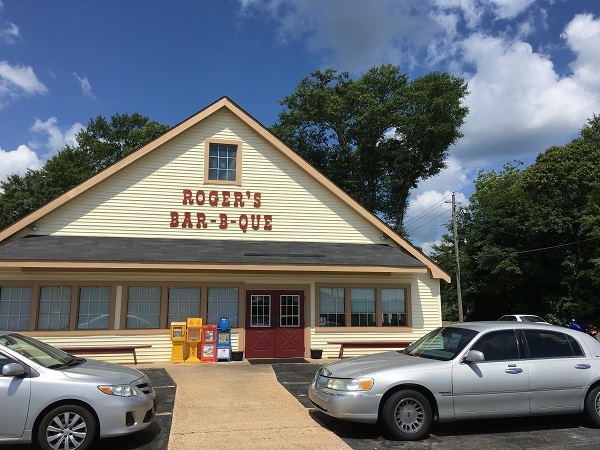 Roger’s Bar-B-Que originally opened in the town of West Point in 1945, placing it among the ranks of the state’s oldest surviving barbecue places. Since 1985, it has been owned by the Striblin family. The first West Point site was a small carry-out place, but it moved to a larger building in the late 1990s, around the time that they opened a second location near the interstate in Hogansville. The LaGrange store is a franchised location, and I’m 99% sure it was originally built as a Mrs. Winner’s. We arrived just a few minutes after they opened. Now, my daughter has never quite got behind our habit of ordering small portions and tasting small bites at several different places on a barbecue tour. What she would most enjoy doing is ordering a mammoth lunch at stop number one and sleep in the car through every subsequent stop. Of all the seventeen year-olds in the world, mine is the seventeeniest. This honestly didn’t work out so well for her here. If you check the map, LaGrange and West Point are north of the Columbus-area mustard sauce region, but there’s still some lingering influence of very old family recipes. Travelers like us shouldn’t be surprised to find that meat in this area is cooked in the sauce, which is a blend of mustard, tomato, and vinegar. The sauce is a little similar to the much newer Hudson’s, which is about eighty miles east. However, I really should have made sure what was going to be served before letting my daughter do her thing; she cannot stand mustard. So my daughter asked for a pork plate with stew and slaw – I’ve raised her that right, at least – as well as fries, and they certainly give you excellent value for money here. The $10 plate is just a huge pile of food, and she really enjoyed the stew and the slaw, but the sauce just ruined the meat for her, proving a point that I made a few months ago, reporting on the first of these four trips. Cooking the meat in the sauce is going to result in disaster if you don’t like the sauce. So I passed her my stew and she gobbled that down. Neither Marie nor I were especially mad about the barbecue either, to be honest, but all the sides were very good. Roger’s is also said to make some really great catfish. In retrospect, I wish that one of us had picked that so we could have sampled more things. Later in the day, at a different restaurant, we’d do it right and order different things and have a terrific experience. Here, though, two of us thought it was okay and one was really annoyed by it. Our son, meanwhile, just had a hot dog and was as pleased as he could be. Posted on August 7, 2016 by Grant G.Posted in barbecue, georgiaTagged barbecue, georgia, lagrange, not fooling anybody.